As projects go, this one was more difficult than most. 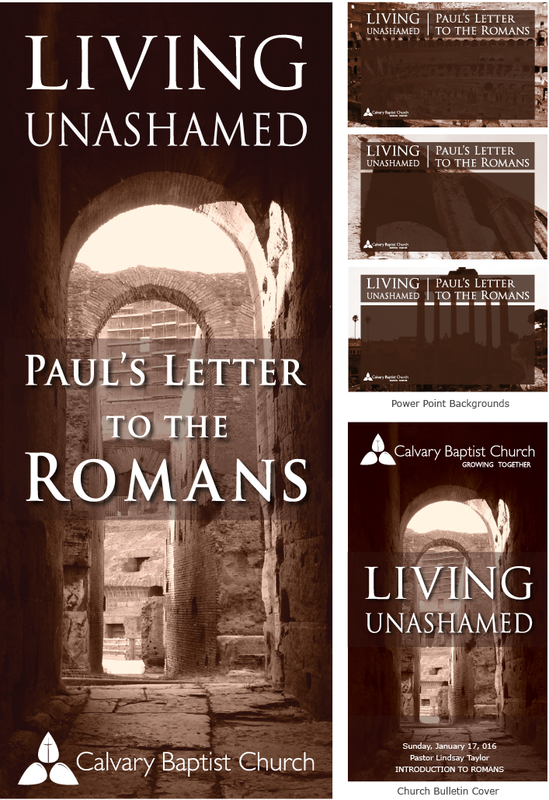 You just have to do a quick Google search to see that a myriad designs for sermon series featuring Paul’s letter to the Romans have been created. The challenge for me was to create something that was not even remotely similar to what had been done before. I wanted to skip the colosseum entirely, not because it isn’t a great icon of what the Roman Christians were dealing with in Paul’s day, but because it seemed so cliche. When discussing the series with the pastor, it became clear that he wanted the series to motivate, challenge, and inspire the congregation. Based on that, and the general theme of the book, I came up with the series title “Living Unashamed”. But where was I to go from there? I was given quite a lot of time to let this project mellow and I very much took advantage of it. It wasn’t until Pastor Lindsay gave me a USB with photos of his trip to Rome that I started envisioning a unique angle that I could pursue. He had one photo of old steps up to a dark doorway that I found very engaging. The resolution was not high enough for a large scale banner, so I started searching stock sites for an acceptable alternative. The image I eventually chose (see below) is a shot from under and into the coliseum. It is likely similar to what the gladiators and those chosen to “entertain” the Roman masses, saw as they prepared to enter the arena. I see this as a vivid depiction of what Christians are faced with as they are challenged to live out their faith unashamed in a world that is full of pain, suffering, and hatred. In the western world persecution is no where comparable to that which the Roman Christians faced, however the challenge to enter the arena and live according to God’s word, whatever the cost, remains the same.